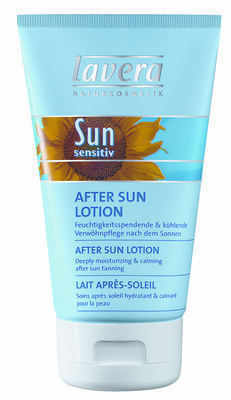 Lavera Sun Sensitive Organic After Sun Lotion pleasantly cools, moisturises and soothes your skin after sun bathing. Moisturising Organic Aloe Vera Gel and Orgnic Sea Buckthorn Oil naturally soothe the skin. After sun bathing essences of Rose, Lavender and Green Tea cools your skin. Skin nourishment is provided through active ingredients of Jojoba Oil, Olive Oil and Shea Butter.